Leasing Available from $20.79 per month! Speed. It's your top priority. You don't have time fiddling with the scanner. You just want to get the job done - fast, with bare minimum amount of time and effort. Now you can, with the Avision AV200 series. 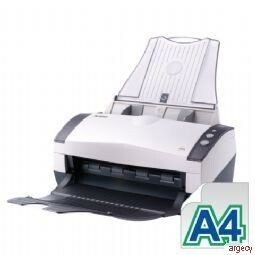 Scan speeds of the AV200 series start from 30 pages per minute all the way up to a blazing 60 pages per minute or 120 images per minute - documents scanned in seconds! Handle up to 50 sheets per batch operation, and get high quality images utilizing professional CCD optical scanning technology at 600 dpi resolution. The AV200 series also introduces the ability to scan ID cards up to 1.25mm thick. With the Avision Button Manager software (included), you can easily complete scanning jobs with a simple touch of a button. The Button Manager allows you to pre-configure various scan settings, simplifying complicated tasks and increasing work efficiency. All that's left for you to do is press the "Scan" button. Job done! The AV220D2+ is one of our fastest scanners at 50 ppm or 100 ipm scanned at a resolution of 300 dpi in color mode. Also featured is our ultrasonic multi-feed detection technology. The AV220D2+ delivers fast scan rates of 60 pages per minutes in simplex and 120 images per minutes in duplex at 200 dpi color or 50 pages per minutes in simplex and 100 images per minutes in duplex at 300 dpi color mode, providing a truly breathtaking digitalizing experience. Avision's innovative front input tray allows you to scan thicker paper up to 1.25mm including business cards or embossed plastic cards such as credit cards with its straight paper path. In addition, the reliable paper feeding system assures you long page up to 3 meters (118") can be successfully converted in color, grayscale, or black and white mode. Scan mixed size documents with one single unit. With a simple touch of the button, users can conveniently scan and send images to E-mail software, specific folder, favorite software application, your printer, or convert into searchable PDF format! AV220D2+ incorporates the latest TWAIN driver with new features and enhancement such as the ability to adjust sensitivity of dynamic threshold, document/photo color matching, custom color dropout, automatic multiple cropping, intelligent multi-feed, reduce despeckle, image count, digital imprinter, and transport timeout. We are committed to improving the TWAIN driver continuously to enrich your scanning experience as never before. The Avision AV220D2+ uses sound waves to detect multiple documents that go through the scanner at the same time. When multiple pages are fed, the scanner detects multi-feed and sends a warning message. This action ensures that all of your critical documents are imaged correctly without losing a single page.